Little Common Football Club captain Lewis Hole clutches the Macron Store Southern Combination League Division One trophy and Division One Challenge Cup. Lewis Hole praised the all-round strength of Little Common’s team after captaining the football club to the Macron Store Southern Combination League Division One title. 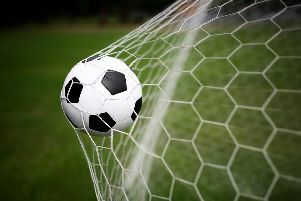 The Commoners finished three points clear of runners-up Langney Wanderers following their 8-0 final game win at home to Billingshurst on Saturday. Hole said: “We had a good squad from the year before when we finished second and we’ve taken it from there. Optimism was in the air, everyone worked hard in pre-season and took it into the season. We had a good start and the momentum has grown from there. Hole scored 36 of Common’s 112 league goals, but was keen to praise the defensive aspect of the game. The 32 goals Common conceded in their 34 league fixtures as 14 fewer than the next best defensive record in the division. Hole netted his fourth hat-trick of the league campaign against Billingshurst to pip Langney Wanderers hot shot Wayne Wilkinson in the battle to be the division’s leading scorer - the third time he has achieved that particular feat in his career. “It was nice to sign off with a hat-trick today,” Hole went on. “I said thank you to the boys - they were all rooting for me to get the hat-trick. I can’t thank them enough. Hole scored 44 goals in all competitions this term - his most prolific season to date in a wonderful career which has yielded a remarkable 322 goals for the club. “I can’t believe that,” added Hole, who described the one goal he scored from outside the penalty area and a top corner strike against Midhurst & Easebourne as his personal favourites. The 33-year-old can now spend the summer looking ahead to leading the line for Common in the Premier Division next season. “It will be the first time Little Common have played in that sort of standard and I’m looking forward to donning the claret and blue at the highest level of county football,” Hole said. Common player-manager Russell Eldridge added: “I guess words can’t really describe what he’s achieved over the last couple of years. “He’s been the focal point of our attack, and him and Jamie (Crone) have had a great relationship over the last couple of years in terms of the goals. They do each other’s work and Lewis gets himself in the right place at the right times to score the goals. “It’s not too shabby to score 44 goals in one season. I’m pleased for him (that Hole finished the season as the division’s leading scorer).